These instructions are accurate up to Mail version 11.5. 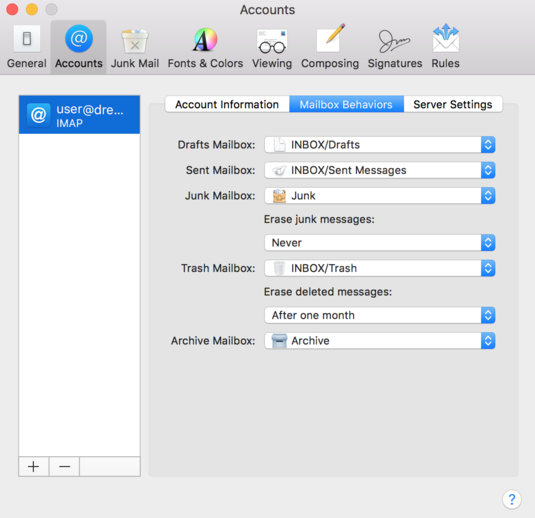 A common issue with Apple's Mail app is that it sometimes does not sync folders from the mail server to the same folders in the Mail app on your computer. If you find folders such as Drafts, Sent, Junk, or Trash are not syncing email as it appears in webmail, follow these steps to correct the issue. Log into the Mail app. View the following articles for details. On the top left, click the 'Mail' menu item. From the list select 'Preferences'. In the left pane, select your email address. In the center section, select the 'Mailbox Behaviors' tab. You'll see options for Drafts, Sent, Junk, and Trash. Click the dropdown next to each to select which folder you'd like to sync between devices. Do not select a folder under the section 'On My Mac' since this is an offline folder and will not be synced. Repeat the steps above for any other folder such as Drafts, Junk, or Trash.